Flowers are not the only thing in bloom this month in #DowntownFranklin. The March edition of the Franklin Art Scene will feature a group of very special budding artists– visual art students from across Williamson County. 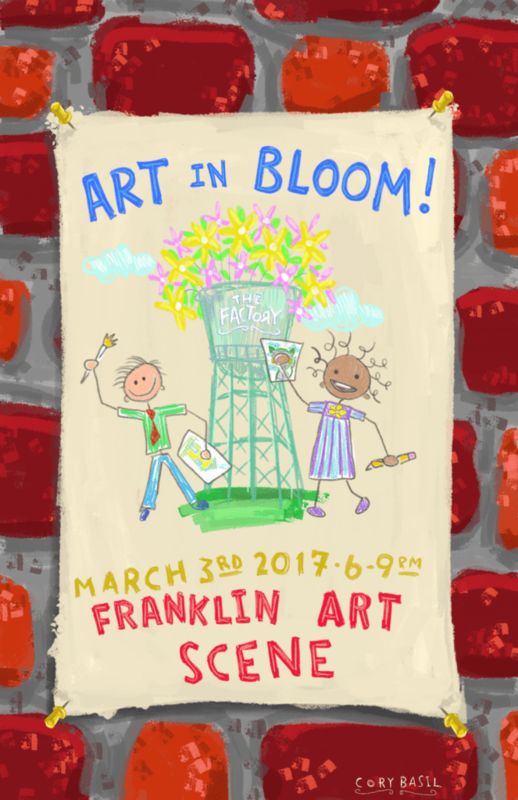 Artwork by students, ranging in grades from kindergarten through 12th grade, will be on display in the Art Gallery at the Factory at Franklin during the free monthly art crawl on Friday, March 3 from 6 to 9 p.m in downtown Franklin. Students’ work will feature a broad spectrum of media and techniques integrated in the different Williamson County Schools’ art programs. The goal of the visual arts programs in local schools is to foster a love and interest in visual art. Students explore art and art-making from many different cultures, time periods and media, all while developing self-esteem, problem-solving and creative thinking. The students’ art will remain on display during the Williamson County Schools Fine Arts Festival on Saturday, March 4 at the Factory at Franklin. To learn more about fine arts in local schools, check out the WCS fine arts website at www.wcs.edu/schools/fine-arts. The Bagbey House, located at 134 4th Ave N, will showcase photos by in-house photographer Jim Booth, whose photos feature local scenes from nature and more. Gallery 202, located at 202 2nd Ave S, will host artist Tiffany Foss. Her painting desire is to attempt to capture God’s creation with the depth of colors and variety of light that can only be enjoyed by stopping and appreciating one’s surroundings. The Historic Franklin Presbyterian Church, located at 435 Main St, will showcase two artists: Sarah Kaufman and Carol Moon. In her work, Moon attempts to capture the celebrations of color and beautiful peaceful moments of observation and appreciation with acrylic on canvas. Hope Church, 137 4th Ave S, will showcase the bright and thoughtful work of artist Julia Roach. She sees the artistic process as an exercise in faith and also as an invitation to reclaim childlike belief. Imaginebox Emporium, located at 311 North Margin Street, will feature original illustrations by Cory Basil. His work is created using multiple mediums, including watercolor, oil and gauche. In addition to his various original sculpture works, high-quality art prints, and published works of literature and poetry, he also creates fully unique and reflective commissioned pieces. Landmark Bank, located at 198 E Main St., will feature paintings by Wendy Fiedor of The Rusted Angel Studio and natural body and aromatherapy products by Cassandra Tucker of Divine Purity. Landmark Booksellers, located at 114 E Main St, is slated to host artist Cathy Buchanan. They will also have live music by Route 40 and Friends. O’More College of Design, located at 423 S Margin St, along with The Arts Company Nashville will host the opening reception for Contemporary Patterns by Denise Stewart-Sanabria. The exhibit will be on display at O’More through March 30. Parks Realty at 415 Main St will showcase the work of local artist Tim Ross. A longtime TV meteorologist, Ross enjoys painting scenes from in and around Downtown Franklin. Artist Sketch Bourque will be featured at Savory Spice Shop, located at 324 Main St. A displaced Louisiana native, Bourque’s work is comprised of drawings, paintings and sculptures. The Cellar On Main, located at 324 Main St, will host Jean Gauld-Jaeger. Her portraits and landscapes have received numerous awards. In her spare time, she continues to study and teach group painting classes and is involved in several art organizations, including the Portrait Society of America and the Oil Painters of America. The Williamson County Visitor Center, located at 400 Main St, will host the creators of the Franklin Coloring Book, Chris Thomas and Caleb Faires. The 60-page premium coloring book features sites across Williamson County and is available for purchase at the Visitors Center. For more information about the event, please visit www.franklinartscene.com or the Facebook page at www.facebook.com/FranklinArtScene.com.